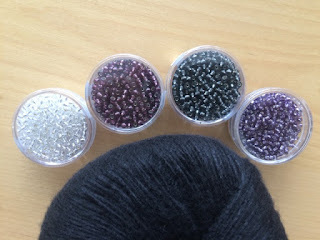 After working the first beading rows I was hooked ;-) It's fun, it's a challenge (sometimes), it's variety and it's fun! 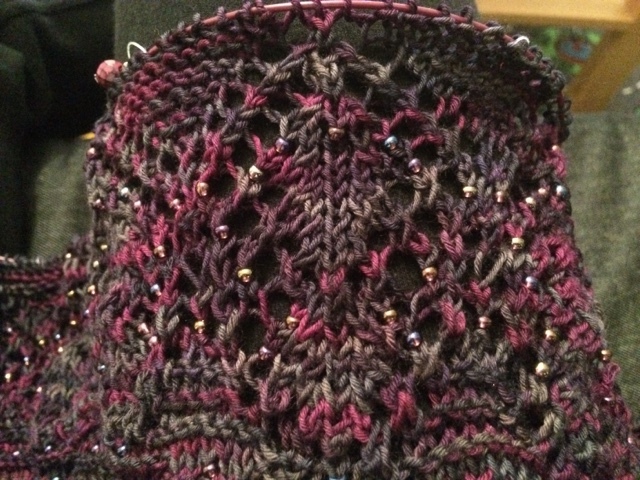 Here's a picture of a lace border repeat, the shawl almost done. Today I managed to actually wash and block the thing. Did I mention that I -hate- blocking? I still hope I did a reasonable job (minor adjustments happened after this picture was taken)... 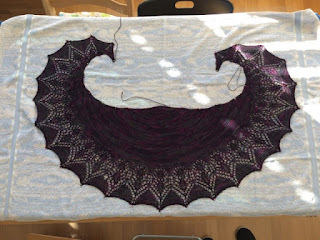 I love(d) the pattern and I think, apart from the Dragonfly Shawl, this has been the second fastest piece I've worked. Did I mention I'm on vacation next week and have a lot of knitting time on my hands? So, I've cast on my Morticia today and what should I say - it looks way more complicated than it actually is. 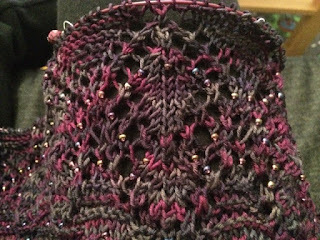 Bev's directions are meticulous and perfect, everything fits together perfectly (yarn, needle size, beads - thank you, instinct!) and I can't wait to have this beauty finished.The beads are a little bit smaller than I the ones I worked with the Mustardseed shawl above, but as the yarn is a little bit thinner as well they're a perfect match.